On this day a year ago, our lives ended, and then they began again. Because a year ago today, Ren had his most major spine surgery. This whole week, FB memories have been reminding me of how raw I felt heading into what I knew was going to be a huge ordeal. I had dreams of a miraculous recovery while also harboring anxieties and anger about how bad I imagined things might go. I wrote FB and blog posts as a way of coping (link and link) all the while knowing that nothing I could do would prepare me for what was to come. 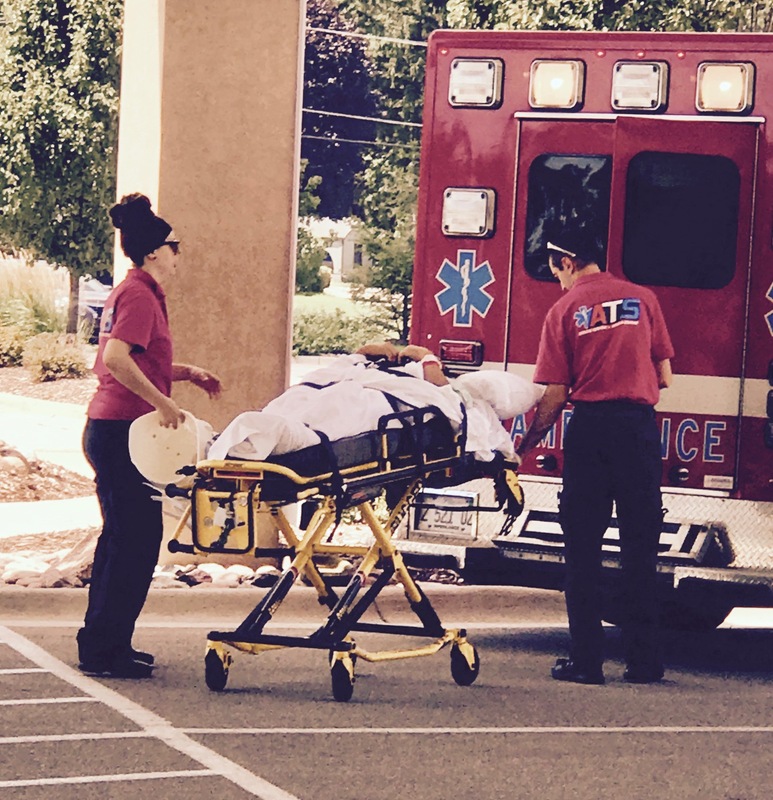 He walked into the hospital (with a cane) and left in an ambulance. 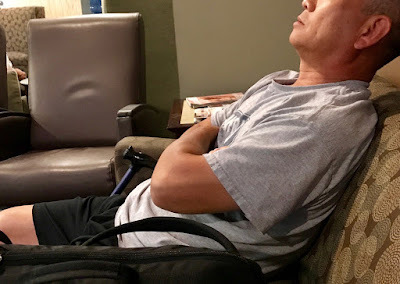 Going into the surgery, it turns out we really had no idea how bad it would be--and that's saying a lot since it was Ren's sixth spine surgery. Despite all we knew about how spinal fusions could go, we were missing some pretty basic information. For example, no one told us they would remove the old hardware in order to replace it with a single rod. Looking back, this seems obvious, but at the time, neither of us realized he would be cut open from the base of his neck to his tail bone. Later we learned that the fusion itself took about four hours, but that it took the surgeon another almost 2 hours just to close the incision. When one of the nurses finally got around to counting them, we discovered that he had 140 staples in all. One hundred and forty--like a tweet, only not. What they removed from his spine. Ren went into pre-op before 6 am and didn't get to his hospital room until after 7:30 that night. 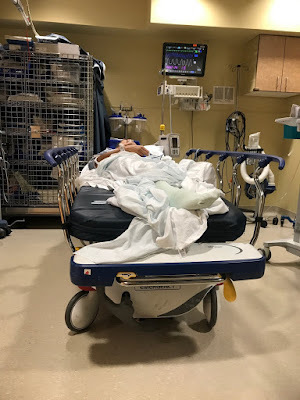 In the meantime, his surgery went an hour longer than the longest prediction and he spent nearly 5 hours in the recovery room as they struggled to get his heart and BP under control. Even though he was one of the first cases of the day, he was also the very last case. 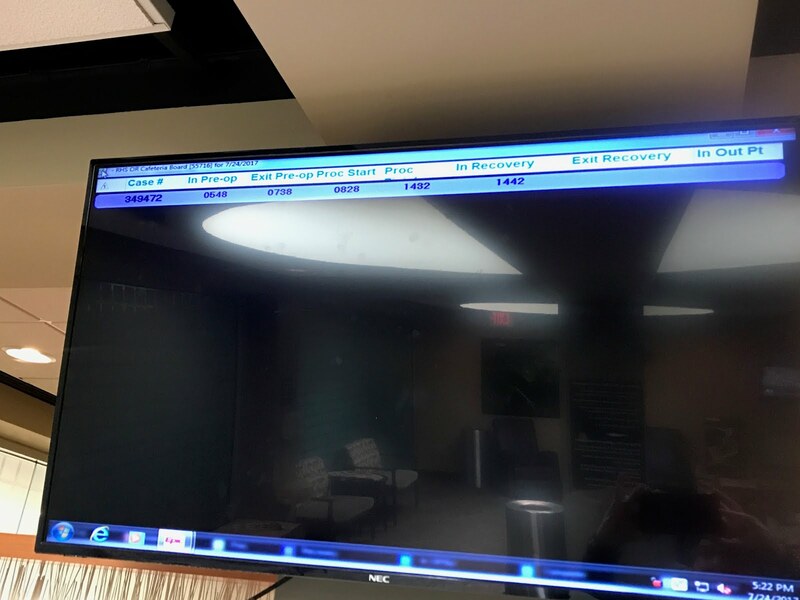 Around 6 pm, after I'd been waiting for 12 hours, they asked me to go into the recovery room with him because they were having such a hard time communicating with him. And, then there was one--Pre-op at 5:48 am. Surgery finished at 2:42 pm. Still waiting at 5:22 pm. Ren had 9 (!!!!!) surgeries before this one, but nothing had prepared me for how bad he looked in the recovery room that night. So many friends got me through that day--texting, FB messaging, bringing games and food, sitting with me. One happened to check in just as I was walking into the recovery room to discover Ren in such a terrible state. That friend surely kept me from being swallowed up by my fear and panic as I felt the floor give way beneath my feet. The neck wasn't suppose to be an issue. 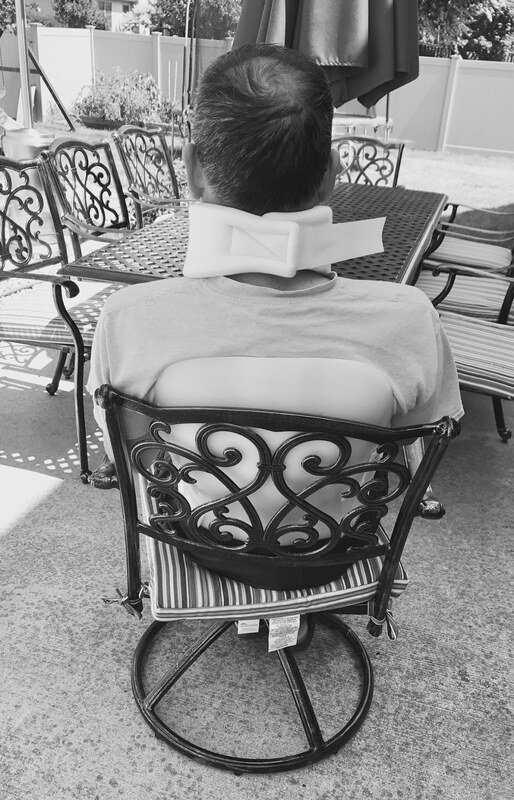 With past surgeries, the long wait on the day of surgery is normally the worst part. This time, though, July 24, 2017 was just the beginning of what I came to see as the eternal post-op of my soul (link). Even though we THOUGHT we'd seen everything over the course of the first five spine surgeries, surgery number six seemed to bring a perfect storm of all the things that could go wrong. Ren had major issues with chest pain and blood pressure management (like what happened with surgeries #1 and #4). One of the kids turned up with MRSA, even though no one had been near the hospital or near anyone who'd been near the hospital (like what happened with surgery #2). We ended up back in the ER, twice (which is one more time than after surgeries #3 or #5). 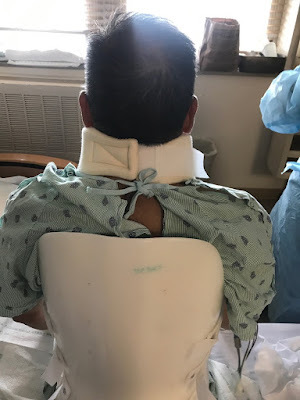 All of those things were at least on our radar as possible outcomes, but what we didn't expect was for Ren to almost immediately lose the use of his right arm, eliciting concerns that the neck had suffered catastrophic damage in the process of repairing the rest of the spine. Transport from hospital to rehab facility. Since he couldn't feed himself or use his arms to help himself walk with a walker, Ren was sent to a rehab facility. The facility provided such shoddy care and messed up his pain and heart medications so bad that he ended up in the ER and then in the hospital for four more days. We left that stay with a new aortic aneurism diagnosis and a strong conviction to never use a rehab facility again. When I finally managed to get Ren home after nearly three weeks in the hospital and at the rehab center, he was less able to care for himself than he had ever been. He didn't go outside again until a month post-op. And, then, a couple of weeks after that, he ended up back in the ER, this time for pulmonary emboli in both lungs. Ren's first time outside, one month after surgery. All this time, I was juggling Ren's care, the kids's needs, everything associated with their schooling, preparation for my classes, and anything else that needed to get done on any given day. Not surprisingly, it didn't take long for me to realize that I couldn't possibly do it all. Less surprising, of course, is that all of the people around me had figured that out way before I did. Even before I knew to ask, they had started to gather around and provide a network of support. They brought food. They encouraged me to let others step in for me at work. They watched my kids. They helped me figure out all of Ren's new medications. They ran errands. They came over after the kids were in bed to have a drink. Bionic man: an x-ray of what Ren's spine looks like now. Looking back over the hellish year that started with a 12-hour day of waiting but that also included the death of Ren's mom (at a time when he couldn't travel to be with his family) and a formal and heartbreakingly detailed autism diagnosis for Stow, I'm pretty sure I wouldn't want to do it again. But, I am also pretty sure that I learned very important lessons (ones I needed to learn) about finding my tribe and trusting (and allowing) people to step up and help. 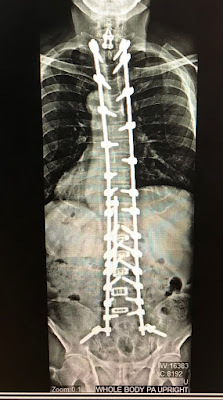 It stinks that it took 6 spine surgeries and a whole lot of pain and suffering for me to figure this stuff out, but, you know, better late than never. About this time last year, I adopted a new motto: "I'm growing as a person, dammit." If I've learned anything through these surgeries and the kids' various struggles, it's that I am not done figuring things out, yet. I suppose that's an important lesson to learn, too.